The afternoon of Sunday, May 7th was a frantic one for New York and the world. The five boroughs were part of a super congesting bicycle marathon, street fairs were aplenty, France was having a controversial election and mayhem prevailed-but not at The JW Marriott Essex House in New York City. Here, all was music, harmony, peace and love. Two magnificent and important “givers” were honored and beautiful young voices prevailed with generous portions of food and wine! Famed Metropolitan Opera mezzo-soprano Jane Shaulis is the President of Opera Index which has been giving awards to young promising singers for 35 years. She proudly gave monetary statistics from Opera Index’s generous patrons and members that were impressive indeed! Ms. Shaulis singled out former Opera Index awardee soprano Jennifer Rowley whose recent performance at The Metropolitan Opera in Cyrano (Roxanne) won the highest praise from the critics. Then with the excellent accompanist Michael Fennelly at the piano, the concert began. Andrés Moreno Garcia started the concert with a fervent performance of “Salut! Demeure chaste et pure” from Gounod’s Faust. Moreno’s robust tenor voice had Italianate flair and French refinement. Moreno commands attention with his polished squillo, fine shading and a beautifully hit high C with a ravishing diminuendo which conjured up an image of his beloved Marguerite. Moreno showed us how to do this aria with ease. Kidon Choi sang the popular “Il Balen” from Il Trovatore by Giuseppe Verdi. Having heard the great American baritone Leonard Warren sing this aria, I dish out praise with extreme caution. Mr. Choi is the possessor of a large baritone voice with some fine shading and an impressive top. Di Luna is not a nice character but Verdi infused Di Luna’s love for Leonora’s aria with some of the most tender and sublime melodies ever. Mr Choi used his voice well and negotiated the passages with eagerness. Leonard Warren, looking down, is rooting for Choi and so are we! rattlesnake. We hope she will grace the world’s stages soon! Angela Vallone the soprano scheduled could not attend. However Vartan Gabrielian, bass-baritone ably filled the void with the glorious singing of Aleko’s song from Rachmaninoff’s opera Aleko! This tall imposing bass-baritone showed his inner Boris Godunov with his excellent Russian diction and emoting. Michael Fennelly’s powerhouse playing in this music took us to heavenly heights! An encore followed with Andrés Moreno Garcia and Kidon Choi singing “O Mimì tu più non torni” from Puccini’s La Bohème. Mr. Garcia’s throbbing tenor and Mr Choi’s generous baritone went to the core of Rodolfo and Marcello’s plight – an unbearable life without their sweethearts. To break the La Bohème mood of nostalgic sadness, Jane Shaulis regaled us with a Doctor-Patient song called The Physician by Cole Porter that was most amusing to hear. The doctor only sees her as a patient, never as a love interest or a goddess! Ms. Shaulis’s glorious mezzo and humorous gestures made for some wonderfully funny moments! The two honorees were given a standing, cheering ovation by the crowd and Dr. Robert Campbell, looking quite chipper, was lovingly assisted to the podium. Dr. Campbell, a noted psychiatrist, was a clinical professor of Psychiatry at Cornell Weill Medical College and is Medical Director Emeritus of the New York Gracie Square Hospital in NYC. He is best known for Campbell’s Psychiatric Dictionary now in its 9th edition by Oxford University Press. He is a Knight of the Orthodox Order of St. John Russian Grand Priory. 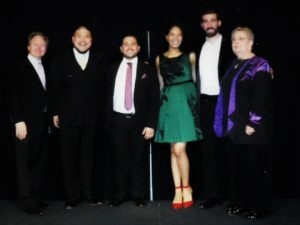 He has been a member of the boards of the Opera Orchestra of New York, Licia Albanese-Puccini Foundation and the Ferro International Program for Operatic Scholars and Students. There is a photo in lobby of Robert Campbell and Cesare Santeramo with Princess Grace of Monaco that was breathtaking! Dr. Campbell accepted his award with a humble and witty speech in which he summarized the joys of living and the joys of giving! Cesare Santeramo, was born in Newark, New Jersey and started singing in the boys chorus of his church when he was six years old. His first attended opera at the Met was La Traviata with beloved diva Licia Albanese and the great baritone Robert Merrill. He attended every Saturday performance until he was drafted into the Army. He sang with the Second Army Major Command Chorus which included concerts with Risë Stevens and appearances on the Ed Sullivan show. Santeramo had a successful singing career with the New Jersey Opera singing 15 lead roles over 25 years with the company including Alfredo in La Traviata with Licia Albanese. There is a photo of Santeramo in the lobby as Pinkerton. Santeramo was a board member of the Licia Albanese-Puccini Foundation for 19 years. At the same time, he was Director of Conference Management and Food Services for AT&T. Santeramo is a Chancellor of of the Orthodox Order of St. John Russian Grand Priory. 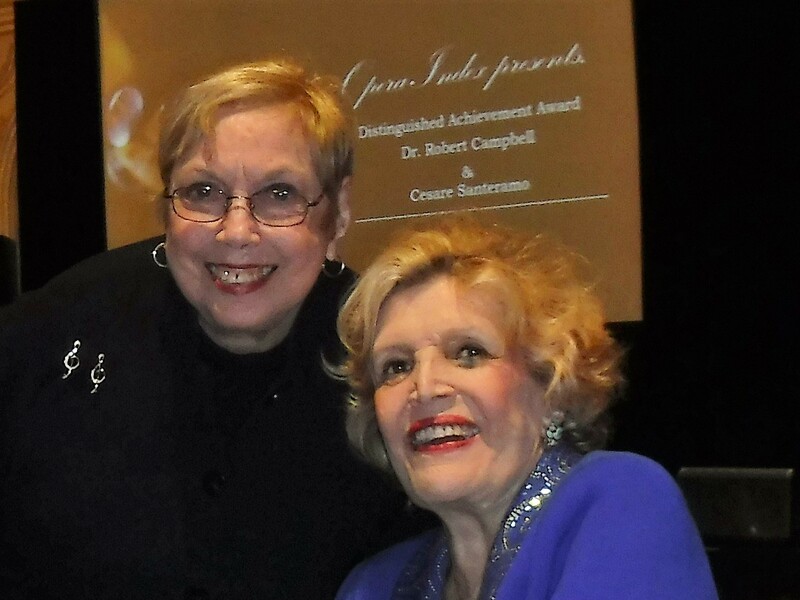 Dr. Campbell and Mr. Santeramo have generously created an annual award for Opera Index with many past winners to the present. Their generosity is boundless. 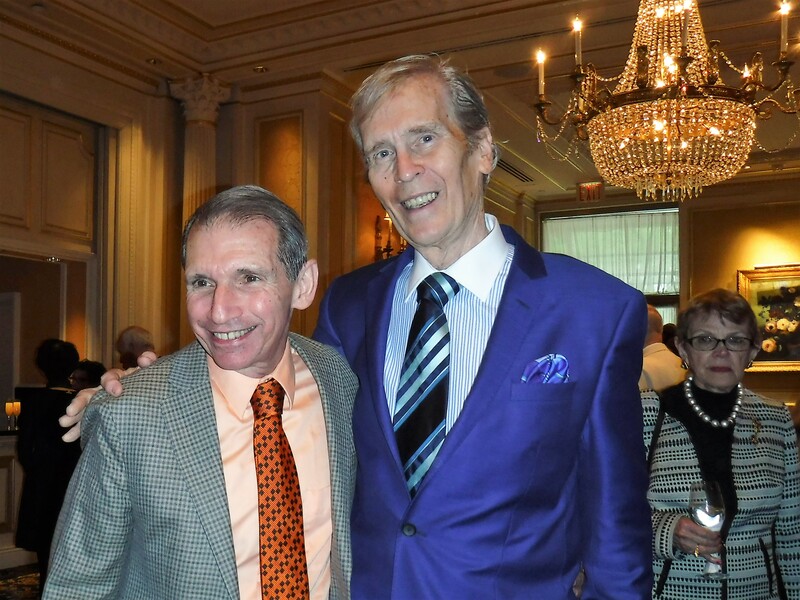 Cesare Santeramo and Dr. Robert Campbell are “Renaissance men” who by virtue of their talents and skills also season the world with elegance, style and grace (and to end it poetically), they make the world a better place! Mr. Santeramo, looking the epitome of chic, graciously accepted the award with praise for his parents, for his lifelong friend Dr. Robert Campbell, for Licia Albanese and to the glorious art of opera. In the star studded crowd were Met opera legends, soprano Elinor Ross, mezzo-soprano Nedda Cassei and long time Met soprano Lucine Amara. 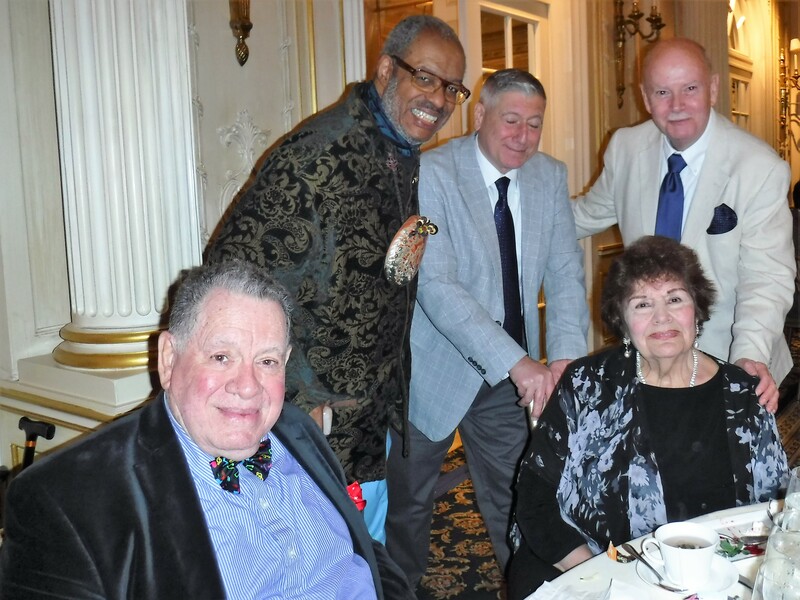 Ms. Amara, vibrant and witty at age 92 regaled us with many tales of the Metropolitan Opera in the halcyon Bing era and beyond. So many legendary comrades like basso Cesare Siepi who she said, loved playing practical jokes onstage, Jan Peerce short in stature but a splendid musician. Ms. Amara should write a book about her adventures in the opera world! Lucine Amara is a proud Armenian American and the Armenian bass-baritone Vartan Gabrielian came to our table to chat with her and express his admiration. New York City Opera soprano Elaine Malbin was ever the soubrette in a flaming red dress and told us of her days with the NBC TV opera. Sachi Liebergesell who is President of the Licia Albanese-Puccini Foundation is among the admirers of the two honorees. 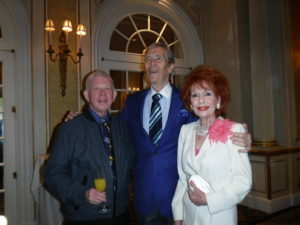 It was so nice to see her among the glitterati. 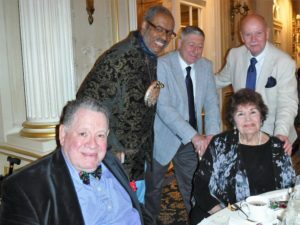 It was great to chat with Murray Rosenthal, Secretary of Opera Index and Vice President and composer Philip Hagemann whose opera Ruth was given at at the Brooklyn Music School around the corner from the Brooklyn Academy of Music (BAM) the night before. Janet Stovin, also Vice President of Opera Index, vividly recalled her childhood in the shadow of Ebbets Field, Bill Ronayne from the Brooklyn based Mario Lanza Society, Maestro Stephen Phebus and Linda Howes, pillars of Opera Index, the sparkling Barbara Meister-Bender and David Bender from Career Bridges, Duane Prinz from Teatro Grattacielo, Brooklyn born opera manager Ken Benson and computer whiz and concert maven George Voorhis and the dashing Dwight Owsley from Opera Exposures. Helen Doctorow, Jolana Blau and author Luna Kaufman lent their vital presence. We recall their valuable work at the Elysium-Between Two Continents headed by Gregorij von Leïtis and Michael Lahr, who are presenting many events in Germany and Europe this summer. 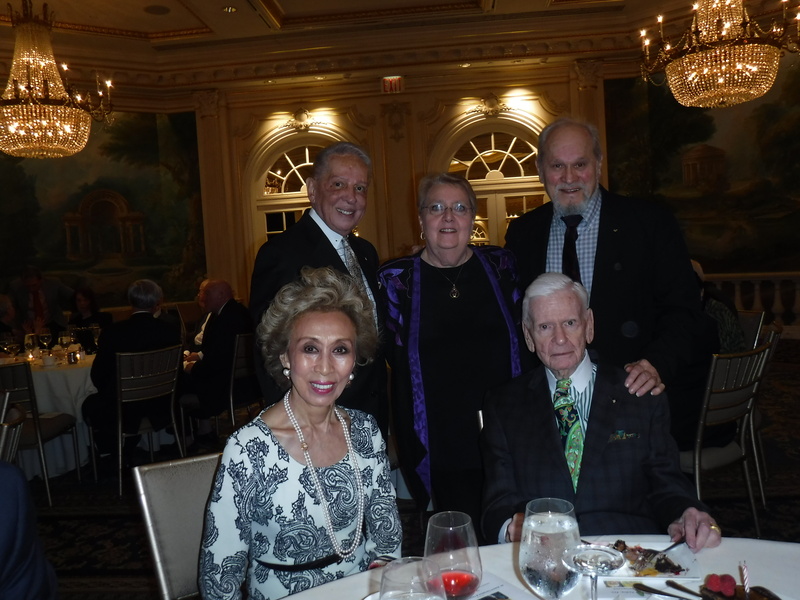 Both Dr. Robert Campbell and Cesare Santeramo were recently honored with the Erwin Piscator Award from Elysium at the Lotos Club in New York City. Edward Jackson, poet-Cavaliere lent his ebullient persona to the mix and the radiant Maestro Eve Queler who gave so many magical opera concerts with the Opera Orchestra of New York. We said a fond farewell at the door to Opera Index President Jane Shaulis and her spouse Joseph Gasperec who help make Opera Index the perfect place to host young singers. Another great party for a truly worthwhile cause. All the best to our gallant Knights – Dr. Robert Campbell and Cavaliere Cesare Santeramo for their many accomplishments and deserved honors!